The SPCA for Monterey County in California rescues, rehabilitates, comforts, and heals animals. They also perform wildlife releases with owls, bobcats, and eagles. 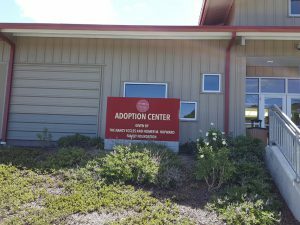 This non-profit organization not only provides adoption, animal sheltering, and many vital services in their area, but they are also very pro-active across the country. They were instrumental in helping rescue dogs from former NFL player Michael Vick, and they helped rescue pets after Hurricane Katrina thirteen years ago and Hurricane Irma in Florida last year. During their cross-country travels, Board members studied the other SPCAs and realized that their facilities needed modernizing, which also meant updating wayfinding signage. 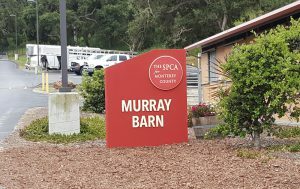 The SPCA for Monterey County had been using simple wood signs-on-wood posts for years, similar to the plain, no-nonsense style on a military base. 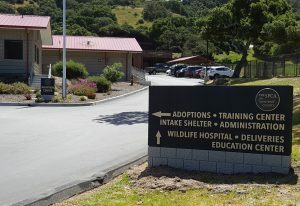 They needed new signage that would complement the more up-to-date, animal-friendly architecture of the new buildings they were planning to construct, as well as the surrounding scenery. For those who know her, it should be no surprise that Merry Trucksis would be awarded the opportunity to design effective wayfinding signage for this property’s new construction. Merry is a long-time sign-maker who firmly believes that all creatures great and small should be treated with kindness and respect. Ever since she moved to the area twenty-nine years ago, Merry has volunteered at this SPCA on weekends. Merry grew up in the textiles industry. Her father worked his way up from mopping floors at a textile company in Chicago to eventually becoming their vice president of sales. He taught Merry everything about fabrics, flags, and vinyl banners. 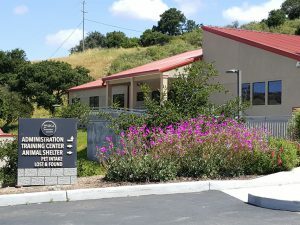 She eventually moved to Monterey County, specializing in flag production, but eventually evolving into a one-stop sign shop due to area customers’ needs. 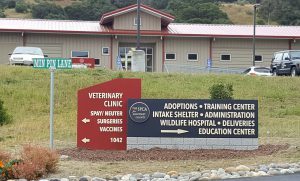 For this SPCA project, Merry envisioned designs that would not only incorporate the heart of the client but also the harmony within the surrounding mountain environment. While volunteering, Merry would also scope out the construction site, which at the time resembled Fred Flintstone’s quarry. She became a reverse-Dr. Dolittle—instead of talking to the animals, Merry needed to talk to the designers and architects behind the new construction, Animal Art (the number-one company that designs shelters across the U.S.). When it comes to wayfinding signage, Merry identifies three elements before crafting visions in her head: (1) the physical environment and its weather conditions; (2) the surrounding architecture and landscaping; and (3) the facility type. Since the new on-property signage was going to feature dimensional letters and logos, leading her to consider extreme weather and other human-involved conditions, Merry selected one-mold lightweight foam coated with Poly-Armor from Peachtree City Foamcraft. She was impressed with their design-and-build knowledge and charity work. “I thanked them for paying it forward to people,” she says. After reviewing the architect’s interior and exterior designs for the building, Merry arrived at three color schemes for the eight different signs—dark green, coral orange, and charcoal gray. The dark green has been featured in the SPCA’s logo since their founding back in 1905. It’s also the color of the exposed pipes that run along the interior walls to the special, energy-efficient roofline that softens the sounds of heavy rains (so as to not scare any animals inside). 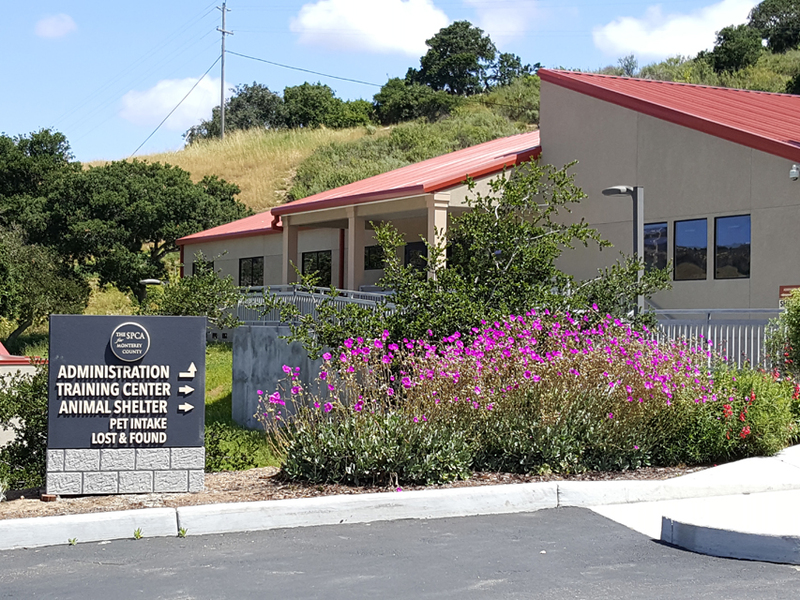 The coral orange matches the roofline of the new SPCA building, while Merry used charcoal gray for the sign bases to brand the architecture with the surrounding nature. The first idea Merry developed was a cross between Western and European-style signage, which would feature a circle floating above a square. It would also be rustic looking, to complement the nearby mountains. Merry thought she would have the first design ready to go and ready to order with Peachtree, though in reality, it took a few years for the entire Board of Directors to finally agree on a modern-style design with rustic elements, amongst the many requests for alterations. Peachtree City Foamcraft built and painted the sign panels, bases, letters, and logos out of Foamcraft straight from Merry’s drawings, specs, and colors. (And, yes, the floating circle was achieved through a bolting system.) All the signs were then shipped in one piece straight to the installer, San Jose Construction.